1 Let’s begin by boiling the pork in salted water until tender. Then, grab a pan and get it nice and hot. Over medium high heat, pour some oil and throw in the onion, ginger and tomatoes and cook this for a minute before adding the pork. 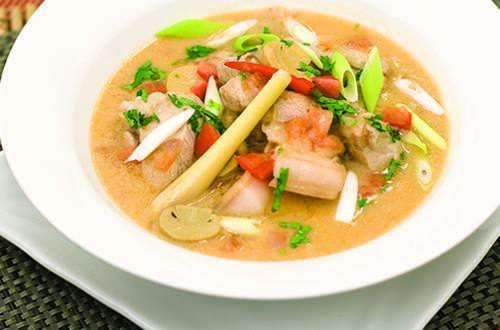 2 Cook the pork for 2 minutes then add the lemongrass, chilli, Knorr Pork Cubes and water. Bring this to a boil then simmer for 8 minutes. 3 The next step is to gently place the Knorr Ginataang Gulay, button mushrooms, wansuy leeks, and then simmer all these at low heat for 10 more minutes. 4 The lovely aroma from this Tasty Chilli Coconut Cream Pork will tell you for sure how good this dish is. What more when you try it?